A festive table makes a Christmas, Hanukkah or New Year’s party more special. By following a few simple strategies, anyone can create a memorable table. The key to a beautiful tablescape is planning the décor ahead of time. A little careful planning makes any decorating project easier, and ensures an amazing result. The color scheme is an important part of any decorating project. When decorating a table for a holiday celebration, color is a key ingredient to the overall effect. Several factors must be considered when choosing colors for a dining table. The table décor should complement the colors of the room, not compete with them. Select colors that will enhance the dining space, creating a cohesive experience for guests. In a room decorated with burgundy and olive green, for example, a table decorated in tones of gold would be lovely. A table filled with shades of blue would be right at home in a room decorated in tan or brown. For simple elegance, shades of white or ivory, along with gold or silver, will add a sparkle to any room. Consider, also, the décor of the home or room where the party will be held. In a traditional setting, the tablescape should reflect that sense of tradition. A modern space requires a contemporary table décor and centerpiece. With a color scheme in place, selecting a centerpiece is much simpler. A centerpiece can be low or tall, depending on the event taking place. For additional drama, nothing beats a tall arrangement in the center of a buffet or dinner table. However, for events where guests may wish to visit with others across the table from them, be sure that the centerpiece does not interfere with their conversations. A shorter centerpiece ensures easy conversation, as well as a view of any entertainment that may be happening at the front of the room. While a centerpiece can be a traditional candelabra or floral arrangement, there are so many other options available today. Often, a beautiful centerpiece can be created from items in one’s own home. A bowl of colorful fruit and nuts creates a beautiful pop of color, and it will be useful in holiday cooking after the party. Branches or boughs from the yard, combined with ribbon and placed in a simple vase, bring the outdoors inside. 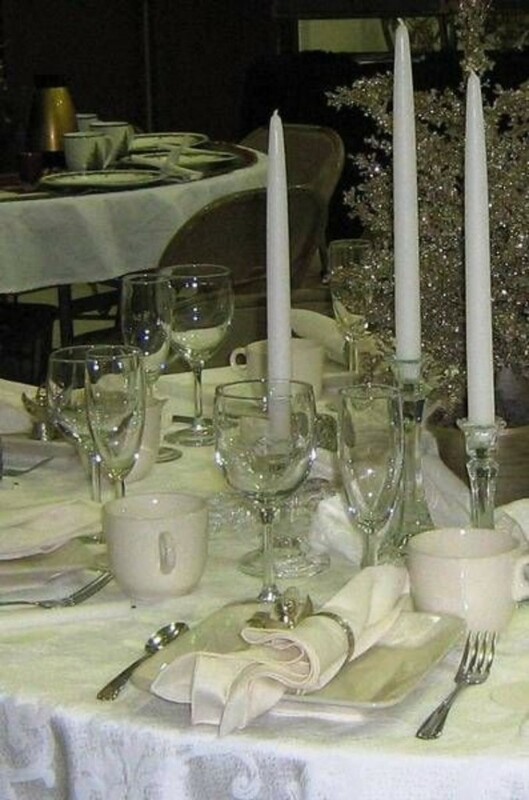 Simple votive candles lined up in the center of the table add ambiance and warmth to any dinner party. The floral aisle at the local craft or discount store yields wonderful options for unique centerpieces. Peacock or pheasant feathers can be placed among sprigs of holly for a twist on a standard holiday arrangement. Branches or reeds covered in glitter add sparkle to a table, and can be found in colors ranging from red to blue to silver. Topiaries, real or faux, can stand in as a centerpiece, as well. Christmas ornaments arranged casually down the center of the dinner table, or placed randomly among the desserts on the buffet table, add elegance without taking up too much space. The plates, glasses, cups and cutlery at the dinner table should coordinate with the color scheme chosen for the overall décor. These items do not need to be fancy china and crystal. Sometimes, the most casual dinnerware creates the most beautiful table. Solid-colored plates, or those with a simple design, will complement both the food and the table décor. Choosing a color is important; the plates and cups should complement the colors of the meal, not clash with the food. Not every meal will look lovely against fuchsia china. However, that shade of fuchsia might make a lovely charger plate, which is a larger plate placed beneath the dinner plate. These are used solely for decoration, and can reinforce the color scheme, setting off the plates beautifully. A tablecloth adds a touch of luxury to even the simplest table décor. Choose a color that will coordinate with the dinnerware; sometimes, a contrasting color makes the plates pop and creates interest to the overall scheme. A tablecloth that blends with the dinnerware will yield a more subtle result. Consider cloth napkins and napkin rings for an extra-special touch. Setting a table for a holiday dinner party does not need to be stressful. With some things found around home, and a few more from the local craft or discount store, anyone can set a gorgeous table.